The RetroSound Hermosa combines classic styling with modern features for your vintage automobile. 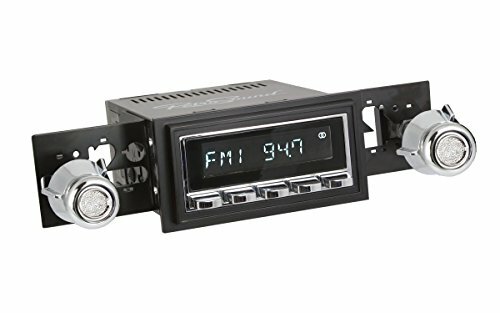 This radio has built-in Bluetooth wireless connectivity for hands-free phone operation and wireless audio streaming. A dual-color display lets you customize the radio to your classic's interior. The Hermosa features a built-in 25 watts x 4 channel amplifier, and front/rear pre-outs to add external amplifiers. A rear-mounted USB input is provided for flash drives loaded with mp3/wma music files. Two standard auxiliary inputs are also provided. Vintage-Look radio dial screen protectors are included for an added sense of realism. Gm and ford licensed screen protectors are available as an option. This application fits the following vehicles: ford: 1967-73 mustang; 1968-79 f-series truck mercury: 1967-73 cougar Chevrolet: 1961-62 impala; 1961-62 Blair; 1961-62 Biscayne; 1961-62 Corvair Oldsmobile: 1970-72 cutlass.